Some resilient vinyl floors are vinyl, but not all vinyl floors are resilient. The most common type of resilient flooring is vinyl, which is why this section's speaks mainly to Vinyl Flooring. 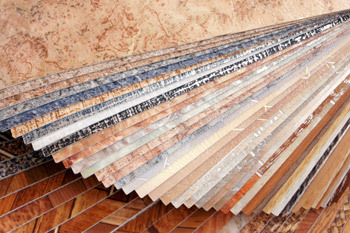 There are many types of vinyl flooring: sheet vinyl, vinyl plank flooring, vinyl floor tiles, self adhesive vinyl tiles, peel stick vinyl tiles, commercial grade vinyl tiles, vinyl hardwood flooring planks and luxury vinyl tile (LVT).our purposes here, and throughout the rest of the sections, we will refer to sheet vinyl simply as vinyl, or vinyl flooring. Resilient vinyl floors, as the name implies, have some "give" or elasticity when you walk across them. Resilient vinyl floors are often used in kitchens and baths because of their good looks, resistance to moisture and wide variety of colors and textures. These floors are relatively easy to keep clean. Their main enemy is grit or sand that can be ground into the surface. No matter which resilient vinyl floor you choose, you will find stylish options, high performance and tremendous value. You can completely customize your vinyl floor by mixing contrasting colors, adding vinyl floor tiles and vinyl plank flooring in a patchwork style, creating medallions or curved cuts that express your unique vision and personality. LVT has all the advantages of vinyl, is available in a wide array of colors and can look good anywhere. Spare luxury vinyl tiles can be kept on hand to repair worn areas, and the LVT format opens up unlimited possibilities for creating your own unique patterns. To start, no other floor covering category offers you the selection, styling, ease of maintenance and value as a vinyl floor! Vinyl flooring can now realistically mimic the look and textures of real ceramic tile flooring, stone tile flooring and wood grain flooring patterns. These amazing replicas have such incredible realism it is difficult for most people to tell whether it's the real thing or not. Who needs to know, right? Finally, a note about linoleum: (which is not a resilient flooring but the one you probably recall as the "original"�kitchen and bathroom flooring) While linoleum is enjoying somewhat of a renaissance, the most popular floor covering material in this category is vinyl.